Hi! I hope everyone had a fantastic Thanksgiving! We headed down to my sister-in-laws for the big feast and had a nice time. This was Bella's first time sleeping away from home and I had the normal first time anxieties :) She did great and was such a trooper. Didn't have any troubles going to sleep and staying on her routine. God is good! Since it'd been so long since I have posted something crafty I thought I'd rustle something up to show you. You'd think since I've been doing so much for the craft shows I'm in this year that I'd have taken the time to snap some pictures, right? Wrong! I haven't a one from any of the shows this year or of the things I've been making! Sheesh! I have one more show starting this Wednesday and running through Saturday...I'm hoping to get some pictures from that show. 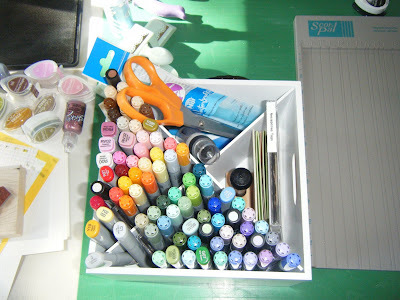 I did manage to find a few pictures of how I'm storing my Copic markers. So I'm sharing those today. My inspiration in using this for my Copics was found on another gal's blog and of course I can't remember what blog it was or who she is! I was blog surfing the day I ran across this and I must not have saved it. This is a fabulous little organizer. It spins and will hold SO much! I am no where near having it full and there is still plenty of room for things. The top portion of the holder is separated into 4 sections. It makes an 'X' shape, which works quite well with my Copics. I have the Copics in two of the sections and the other two hold a little bit of this and a little bit of that. I have a pair of scissors, liquid snow(like liquid applique, but a different name), niji waterbrush, cd holding my tag nesties & a few more random things. If you look at the side, there is a little drawer right there. 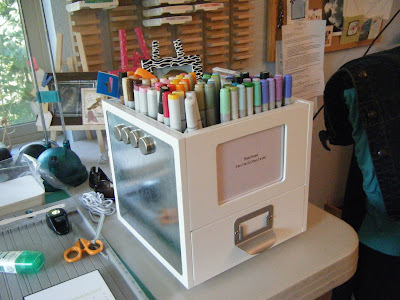 I have put all of my Stampin' Up markers in there. They fit perfectly. I am just a few away from having all 48 colors (I have the ones I need right now) and there is still room for the complete set. I was trying to get all my coloring mediums and tools in one spot and the SU markers was posing a problem for me. Then I thought of this and I love it! Works great and the best part is that they are still able to lie on their sides. On the other side of the holder, there is a little pull out set of three drawers, which you can't see from the view of the picture here. Inside that I have a tiny measuring tape, felt pads for my alcohol ink applicator and some rubber bands. Now, you're probably wondering where I got this. It came from one of our favorite stores....Target! If I remember correctly, it was only $19.99...a great buy for the amount of storage this puppy has! Honestly, I'm not sure if they still carry them or not...but I love it and think it's great!